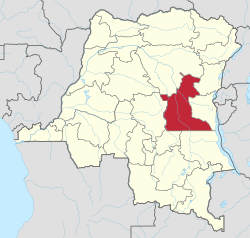 Maniema is one of 26 provinces of the Democratic Republic of the Congo. Its capital is Kindu. Maniema borders the provinces of Kasai-Oriental to the west, Orientale to the north, North Kivu and South Kivu to the east, and Katanga to the south. Mining is the main industry in the province and diamonds, copper, gold and cobalt are mined outside of Kindu. Kailo Territory is home to open pit wolframite and Cassiterite mines. ^ Central Intelligence Agency (2014). "Democratic Republic of the Congo". The World Factbook. Langley, Virginia: Central Intelligence Agency. Retrieved 10 May 2016. ^ "Mining in Kailo". Flickr - Photo Sharing!. This page was last edited on 18 December 2018, at 00:51 (UTC).